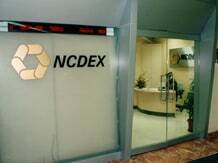 Aiming to help hedge risks against adverse weather conditions, the National Commodity and Derivatives Exchange (NCDEX) will shortly be launching a set of exchange- traded weather insurance products. As NCDEX is currently being regulated by the Forward Markets Commission (FMC) whose norms don't allow any such product, it is waiting for the merger of the commodities regulator with the Securities and Exchange Board of India (Sebi) to be completed by September end, before it formally unveils the product. "We are planning to launch exchange-traded weather insurance products once the merger of FMC with the Sebi is completed," NCDEX Managing Director and Chief Executive Samir Shah told reporters today on the sidelines of an agriculture insurance seminar organised by Swiss Re here. The FMC's merger with Sebi is slated to be completed by September 28. "At present, NCDEX is being regulated by FMC and there is no provision under FMC rules to launch any such product. In contrast, Sebi allows such products," he added. Such products are quite relevant for both farmers and insurers as any kind of loss caused by inclement weather can be compensated through these products. "While our products will be sold by brokers, it will be NCDEX, which will settle the claim. The products will be sold to farmers, insurers and other players like warehouse owners whose activities are linked to weather and the price of the product will be determined by the market and index will be traded at the exchanges," he said. "The insurers will get benefited through these products as any kind of claim which linked to the monsoons, can be compensated through these products. Still, insurers will have to take permission from the insurance regulator Insurance Regulatory and Development Authority (IRDA) to buy the product," he said. "NCDEX will tie up with companies like Skymet which have the infrastructure and data. Our job will be to construct the index out of that data," he said. According to a report by Swiss Re, which was unveiled today, the annual agricultural insurance premium, which stands at $700-800 million, may increase to USD 1 billion over the next five years. Swiss Re is the second-largest reinsurer in the country which has normally been dealing with large corporate and life reinsurance business so far. However, it is now eying new areas of insurance in the country which include agricultural, aquaculture and livestock insurance. "Offering localised and tailored policies can be an effective way of convincing livestock farmers to take interest in insurance. Bundling revenue protection cover with livestock insurance could be another," Swiss Re's Agriculture Reinsurance Head for Southwest Asia Harini Kannan said.